It looks like Kanye West and Adidas have multiple "Static" Yeezys releasing later this year. Just last week, sneaker source @TheYeezyMafia reported that a Yeezy 700 V2 "Static" is on tap to release in late December or early January of 2019. Today, @TheYeezyMafia relayed details of a similarly styled Yeezy Boost 350 V2 which will reportedly hit retailers during the holiday season as well. While the newly unveiled "Static" Yeezy Boost 350 V2 sports the same low-top silhouette as other Yeezy 350s of old, this particular pair is unlike the others in that the primeknit design is much more intricate. 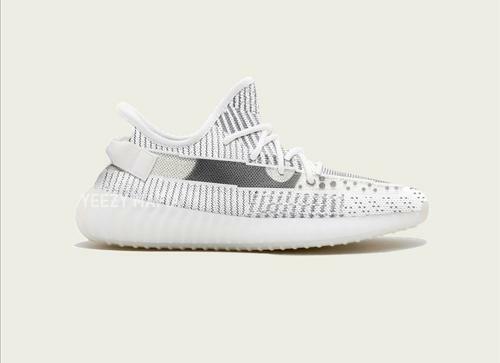 Additionally, the Static Yeezy Boost 350 V2 utilizes a semi-translucent upper in place of where the sneaker’s familair “SPLY 350” branding and midfoot stripe. In addition to this brand new Yeezy colorway, is also being reported that Adidas will release a "Sesame" Yeezy Boost 350 V2 in October, along with restocks of the "Semi-Frozen Yellow" and "Zebra" colorways. Adidas has not officially unveiled the "Static" Yeezy Boost 350 V2 but you can get a good idea of what to expect from the image embedded in the tweet below.